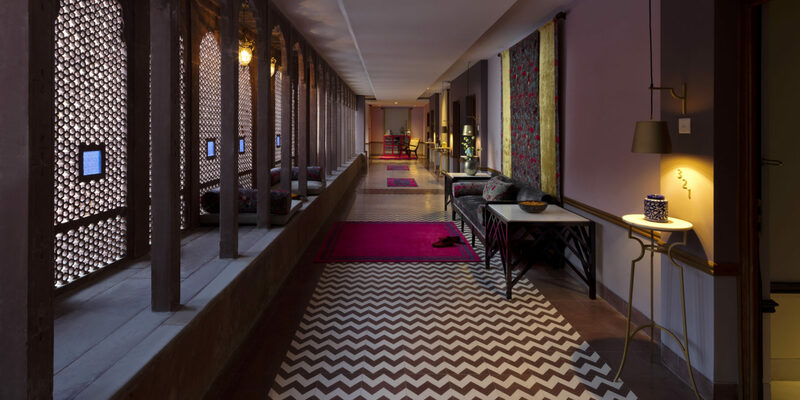 In the Guest Rooms, the theme of India prevails – past and present. A patriot to the core Narendra Singhji championed the royal states and principalities when he was both prince and king; and equally heralded the arrival of a new democratic India when she emerged from the ashes of the British Raj. Keeping this in mind, the hotel continues to salute the vision of its last Maharaja. Comfortably appointed, the Residence Rooms are a tribute to the eclectic tastes of the household. Elaborate ceiling details, Bikaner terrazzo floors and traditional crafts sit in harmony with Portuguese tiles and a distinctly English colour palette. Light and fresh, these rooms are a calm sanctuary set apart from the hyperactivity of the city. 53 rooms - 330 sq. ft. The young prince on the threshold of maturity designed his apartments to reflect his growing leanings towards a western lifestyle. Featuring Luxe velvets, English prints, glittering mirrors and mosaic, the Prince Rooms reflect a youthful exuberance that beget glamorous living quarters. 18 rooms - 530 sq. ft. The Regimental Rooms reflect a ceremonial order that appealed to the military man who was king. Elements of army regalia are sensitively interspersed with modern conveniences adding uniformity and symmetry. These rooms are thoughtfully curated with objets d’art and a rich colour palette that adds a vibrancy and immediate comfort to these stately rooms. 3 rooms - 634 sq. ft. The India rooms are quintessentially Indian but fashioned for the cosmopolitan traveller such as yourself. Here, strokes from pastoral India sit comfortably with the modernity of a contemporary India. Curated primarily in Indigo - the symbolic colour of India, these rooms are a cocoon where comfort and contentment are accentuated. 4 rooms - 530 sq. ft.
Quite apart from the theme that runs through our other guest rooms the republic suites are dramatic rooms where strong confident lines and a colour palette in steely blue and concrete grey suggests a very contemporary conclusion. Chic to the core, this is an architects’ room – inspired during an era when the great architects of India – stalwarts in the imagination of the public created spaces that were startlingly new. 4 rooms – 730 sq. ft. The deep blue infinity pool takes its colour from the bright and light Bikaner sky and offers great vantage views of the city, both the old and the new. The space transforms at twilight and takes on a mantle of celebration with starlit skies, live grills and party music. A state-of-the-art gym equipped with weight training as well as cardiovascular equipment. An indoor-outdoor easy lounging area, the Verandah suggests a mood of effortlessness and relaxation in an eclectic setting. The adornment is strongly influenced by the Bombay Art Deco movement; motifs and design elements present an interior that is reminiscent of a vibrant bygone age. Modern Indian furniture, Portuguese tiles and Tribal artworks add vibrancy to the décor. The relaxed easy charm of this space serves well as a Library where the specially curated Penguin Classics Collection will add singular enchantment to any curious mind. An electric red Baby Grand piano, our ‘Edith’, sits at one end heightening all that this space recommends. The daytime menu segues into an evening presentation of Cocktails and Snacks all especially fashioned for this space, this hour, and you! The Diwali Chowk is the central courtyard at the heart of Narendra Bhawan Bikaner. Dotted with canopies, fruit trees and low Indian style seating, it is ideal to experience the Bikaner Badakhana and savour Marwari cuisine with the pomp and circumstance that is emblematic of a Royal Bikaner. The gold and the crystal rooms derive inspiration from the age-old tradition of smoking rooms for gentlemen and withdrawing rooms for ladies. Distinctively demarcated in space and décor these rooms offer a glamorous retreat serving vintage cocktails and after dinner drinks over conversations and sotto voce gupshup. Inspired by the royal patronage of the local artforms of Bikaner, The Gallery at Narendra Bhawan pays homage to its original resident. It also serves as a platform for the local artists and craftsmen that enables our guests to catch a glimpse of the cities rich artistic heritage.